Renault's global vehicle sales rose 3.6 percent to a record 2.72 million vehicles in 2011 despite a weak European market, helped by strong demand in Russia, Turkey and Latin America. 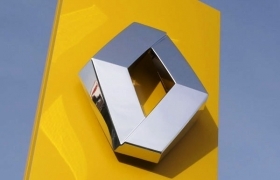 Jerome Stoll, Renault sales and marketing chief, said the company will continue its expansion in global markets in 2012. Non-European sales accounted for 43 percent of the automaker's volume in 2011 up from 37 percent in 2010, he said in a statement on Tuesday. Renault forecasts that the global car market will grow 4 percent this year, but that Europe will slip by 3 percent to 4 percent, with France's market falling 7 percent to 8 percent. Stoll said fresh products such as the new Clio subcompact and the Zoe subcompact electric car will help Renault counter Europe's uncertain economic and financial environment. In Europe, Renault's sales declined by 5.7 percent to 1.55 million. In France sales fell 7.5 percent to 689,022, while volume rose 5.7 percent to 181,176 vehicles in Germany. Russian volume grew 60 percent to 154,734, helped by strong sales of the Logan, Sandero and Fluence models. Russia was the automaker's fourth largest single market last year, ahead of Turkey, where demand was up 23 percent to 140,827 vehicles. Growing demand for cars such as the Sandero hatchback helped Brazil replace Germany as the company's No. 2 single market after France. Sales in Brazil increased 21 percent to 194,300. Sales in China, where Renault has only 80 dealers, rose 65 percent to 24,275 vehicles, boosted by sales of the Koleos SUV. Renault brand sales rose 6.8 percent to 2.26 million, accounting for 83 percent of group sales. Sales of the group's third brand, Renault Samsung, fell 27 percent to 118,135.